In case people still aren't convinced by the stories I've told about seatbelts, I got an email from a reader a few days ago with a story of her own. (Coincidentally, my last seatbelt post was exactly a year ago today. Strange.) Miss X (not her real name) not only gave me permission to post her story, but she asked if I would share it. To protect her identity, some names and details have been changed. A few days ago I found a tree at 40mph on a back country road and I have always worn my seat belt but I had never been saved by one. My friend (whose truck it was) had pulled over because she was crying about unrelated marital issues, so I took over driving and was trying to turn around to go home for ice cream and a chick night. Instead, the Chevy Silverado hit the tree head on. I had never driven the truck before and it was dark and raining on the curvy back country road. I broke the metal pedal on impact. We were three inches from being legless and five inches from being crushed. My chest broke the steering wheel off and pushed the steering column down three inches. 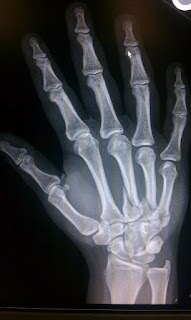 I broke my 3rd, 4th and 5th metacarpals in my right hand when the impact caused me to punch the radio. My friend did the same, but she spiral fractured her left middle finger. So we have matching purple casts on opposite hands. We joke that we fist bumped mid impact. My ribs are sore and my back muscles are not happy but because of our seat belts we walked away from what should have been a fatal accident with a collective four broken bones in our hands, sore ribs, minor airbag burns, and deep seat belt bruising. Without our seat belts we would have been thrown headlong into a tree and possibly died on impact. With them we both walked away with relatively minor injuries. 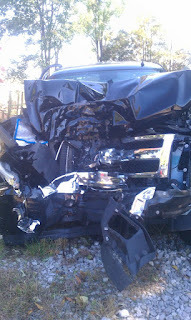 In the pictures, the big dent in the side of the truck shows that when we impacted there was enough force to wrench the truck bed back two inches, and it also dropped the spare tire from under the bed. 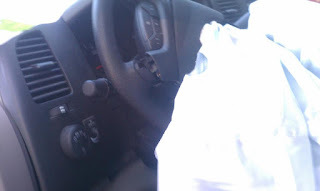 If you look below the buttons on the steering wheel you can see how I broke it. The tire in the picture is at an odd angle because the front axle was cut in half by the transmission being forced into the manifold by the engine. The X-ray is my hand. It was actually scarier to see the truck afterwards than the actual accident was. Thank you for being a wonderful person and doctor. The world needs more people like you. And this, of course, is her hand with the three broken bones. This is the sort of accident where you could say, "It could have been worse." You could try to argue that she was just lucky. No - I prefer to think of her as smart for using the very device that was designed to save her life. Thanks, Miss X, for sharing your story. I hope others will learn from you. I have to agree, however remember he is a doctor and works at two hospitals. I'm sure the work hours are long and he might not get a great amount of free time. This sort of thing amazes me! 40mph is the speed you reach after jumping from 55 feet in the air. Now, with a few of the Doc's patients as exceptions, your odds of walking away from a 55-foot jump are not that great. The difference when you hit a tree at 40 in a truck is that you are surrounded by the embodiment of decades of research which has been designed to sacrifice the vehicle in absorbing the energy of that impact. You have belts, and airbags and crumple-zones and pre-tensioners and parts that are designed to break and move and bend in pre-calculated ways to protect the passengers as much as possible. The problem is, all of this stuff only works if you remain in your seat! It's no good the engine block stopping an inch before it hits your knees if your knees have joined the rest of you as you punch through the windscreen and into the tree! Human beings are uniquely capable of helping each other, but all that effort is wasted if you won't do those little things to help yourself! Well done Miss X - sorry you had to test out all of that engineering but I'm glad you chose to allow it to do its job. Hope your hand mends quickly. Ugi, I always see your comments on almost all of Doc's posts and I want to say great job to you, keep up the good work! Love reading your comments :) You deserve a medal of some sort. I rather thought that I just ranted on and bored everyone so it's kind of you to say otherwise. I must admit that I often find the Doc's posts interesting from a scientific point of view, as well as being entertaining. I, too, am only alive because seatbelts have saved my life multiple times. I have lost control of a vehicle and rolled it and come out unscathed because I was weaing my seatbelt. I was also on the side of the highway due to car troubles only to have a drunk driver come along and rear end me at 60+ mph. That time I had only a minor cut from flying broken glass. Seatbelts do save lives. I'm LIVING proof.